"I have a dilemma, I have two weddings in August and don't know what to wear. One is a day wedding and the other in the evening. I have an apple figure, empire dresses make me look pregnant so I need to avoid them. I will prefer pantsuits if possible." I wasn't able to find much in the way of pantsuits, so I decided to put together my own jacket and pant based outfits. 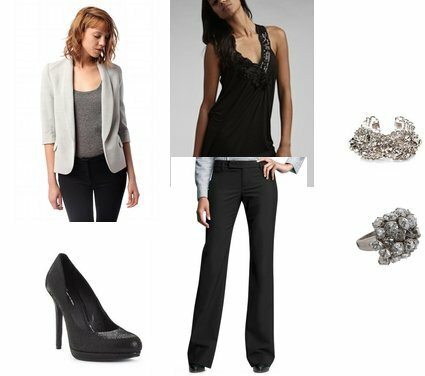 This first look was inspired by this look from Ann Taylor, but I dressed it up a bit to make it more wedding appropriate. You can click on any of the photos in this post to purchase these items. If you don't like the shirt shown in this first set, I also like THIS one. I love the cropped pants in this second look, but if you prefer you could also do a bootcut as seen in the first set. Although I think either of the looks above would work for day, I came up with a lighter version that I thought would also be day appropriate. Earrings by Dabby Reid Ltd.
And finally, a fourth look, inspired by this Albert Nipon pantsuit from Neiman Marcus. This is a primarily evening look, in my opinion. As an apple shape myself, I would wear 2or 3. I think the first top looks too tight unless you have a superflat stomach. 3 is very nice but no white jacket. I would also like the ruffle top in 3 with the black pants. Thanks for the feedback Morgan! I removed the jacket from the third look and added an alternative shirt link for the first set.